It was brought to my attention that I missed blogging about the letter "L". I show a small portion of my knitting library. I think that the earliest acquisitions are Barbara Walker Treasuries. I also lucked into the Principles of Knitting just before it went out of print. I have some older books, but they were I got them later. 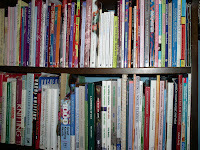 The library also has a large number of magazines and a small crochet library. The new windows and resulting "great ideas" have disrupted my knitting sanity. All my knitting storage is where I can't get at it. There are boxes of yarn on my back porch, under plastic. My drawers of yarn are in my dining room, with 6 feet of stuff between me and them. I can seen the drawers, but not reach them. Luckily, I have several projects which were packed for the California trip. I also can get at my sock yarn stash. After making the teal jacket, I started a few pieces which coordinate. There's a really great print skirt, and out of the left over fabric, a matching blouse. I underlined the skirt, because the fabric is very light weight. It's some sort of rayon blend. I used polyester lining for the underlining. It worked very well. I recently bought some solid fabrics which also will expand this wardrobe with more blouses. 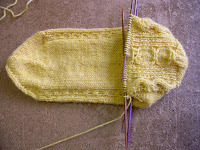 The July Mystery sock clue #2 has been published. The pictures show progress as of yesterday. 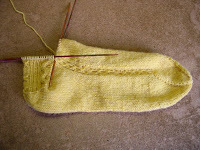 The longer sock does not show all of the clue, but I'm bringing the second sock up to that point. The stitch holders you wonder about? I made them yesterday from scrap leather and elastic. I once bought a leather stitch holder, but I lost it. The Tour de Sox Yellow Jersey Socks have a heel. 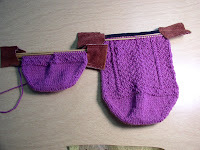 It was quite challenging, because I had to cable of the wrong side of the fabric. 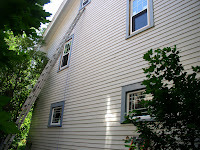 The pictures show the"Wheel" cable and what I'm calling the Hills and Valleys cable. The rib in between reminds me of tire tracks. nice socks! which tutorial/technique did you use for the toe up heel flap? i haven't found just the right one yet!